You don’t have to sign up for talks. Made by mathematicians for mathematicians, L2F is on a scientific mission to bridge topological data analysis and machine learning. With an established research program in TDA and already serving global players in IoT and manufacturing, the shipping industry, quantitative trading and other sectors, we believe our strong mathematical core and our understanding of software frameworks empower us to deliver game-changing solutions. As a start-up committed to empowering business with AI, we defy the concept of black box through the study of the geometric structures that underly complex systems. In this talk we will present who we are and what we do, with a focus on our research program and the topological structure of learning. While at the beginning of the 80s the CD player, the first consumer application for lasers, found its way into almost every household under great attention, today we almost constantly use laser diodes, often without noticing it. In this lecture the physical basics of AlGaAs semiconductor lasers will be discussed first. Subsequently, the manufacturing process of the laser diodes is briefly described. The third part discusses some of the above applications in more detail to give an impression of the variety of applications and their importance for our lives today. Claim processing in insurance is at the core of its operations and business. Even in the case when claims are processed entirely electronically it is rather hard to assess all of the new claims automatically. The industry standard is to use Rule Engines with a large set of expert-written rules. The limitation to this approach is increasing complexity of rules and the related maintenance. Additionally these systems fail to classify a significant portion of incoming claims. 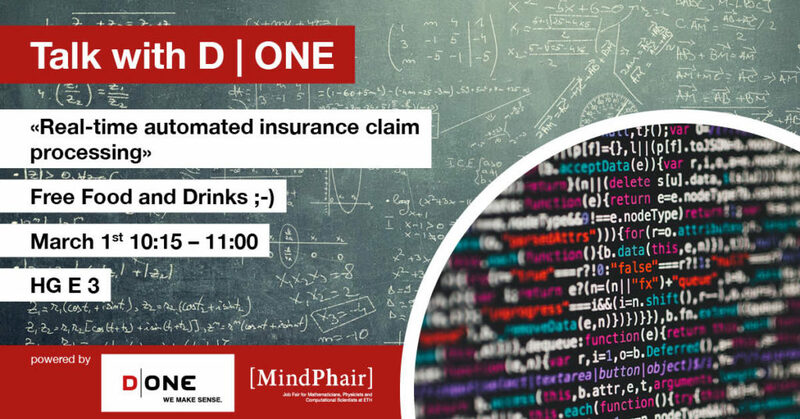 In this talk you will see the automation of the processing for complex claims using machine learning methods: the journey with our client starting with an initial proof of concept, through the definition of the business case, and the implementation of the machine learning algorithm, all the way to the deployment and the operationalisation of the new system. A particularly focus are the used state of the art NLP methods, namely word2vec, to define a similarity measure and learn a sparse space for 100’000 features. Additionally you will see how we built an intuitive validation framework, thus building trust in the approach. We want to give you an overview what we have achieved with Blockchain-Technology at Swiss Federal Railway. In addition, we will also give you insights into a showcase on how we secure one of the greatest buildings in the history of mankind with the greatest technology which ever existed. Einblick in den Arbeitsalltag als Aktuar im Aktuariat der Zürich Leben Schweiz anhand von zwei Praxisbeispielen: R für Risiko und Rückversicherung, ein Praxisbeispiel. Einsatz von R Shiny für die Berechnung von StopLoss Offerten. Bestimmung von Best Estimate Annahmen für Sterblichkeit.